We have a relatively small bathroom. Actually it is decent sized for NYC, but that doesn’t mean it isn’t small. We are very lucky because it has a skylight so it is nice and bright. We like to make it feel as open as possible and decided that a good way to do that is with a clear shower curtain with a design on it. We chose fish. 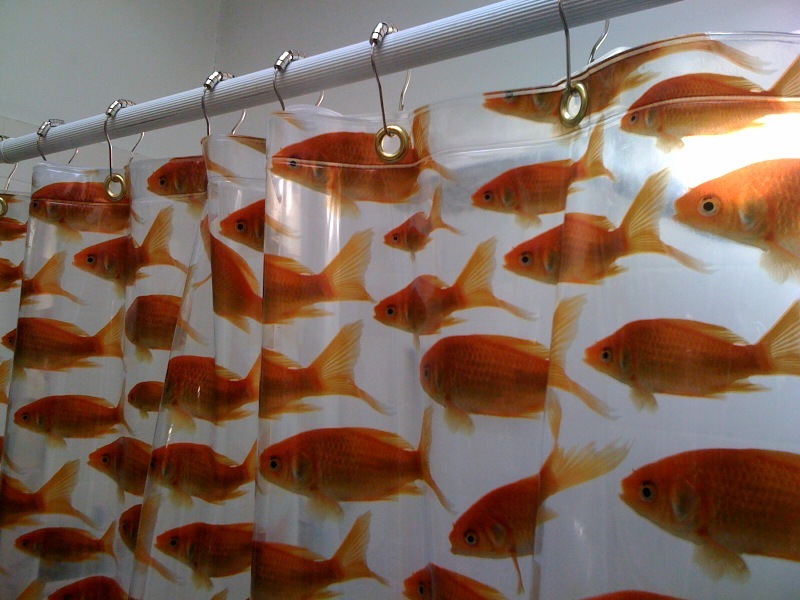 Sadly our fish shower curtain is a few years old and the holes have seen better days. OK, it might be time to search for a new one. Easier said than done. There are plenty of lovely shower curtains out there, don’t get me wrong, but most of them are not clear. Turns out the only one we saw that we liked was the replacement to the one we have! Sigh. What fun is replacing what we have? Well fine, since the only problem is that the holes are ripping, let’s fix that. Grommets! Perfect. I have to say that a little bit of time spent really paid off. The shower curtain looks better than ever! I should have done this when it was new.